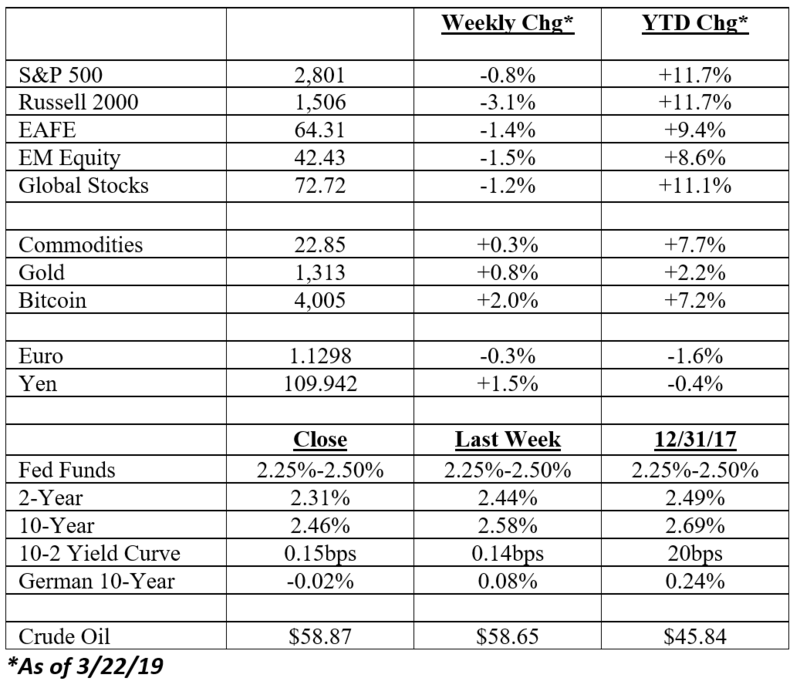 It was an eventful week for the markets given the Fed announcement on Wednesday and then a key move in interest rates Friday. The Fed really didn’t surprise. As expected they kept rates stable and signaled they probably won’t do much all of this year (more below). Probably more eventful was the push lower in longer-term interest rates around the world. Equities around the world were weaker with the S&P losing -0.8% over the last five trading days while small-caps were hit with a -3.1% loss. 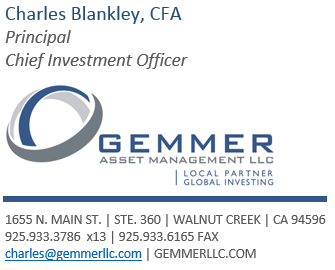 The bond market rallied hard on the Fed news and rallied almost as much on a soft manufacturing report out of Europe on Friday. The yield on the 10-year Treasury fell 12bps to 2.46%. 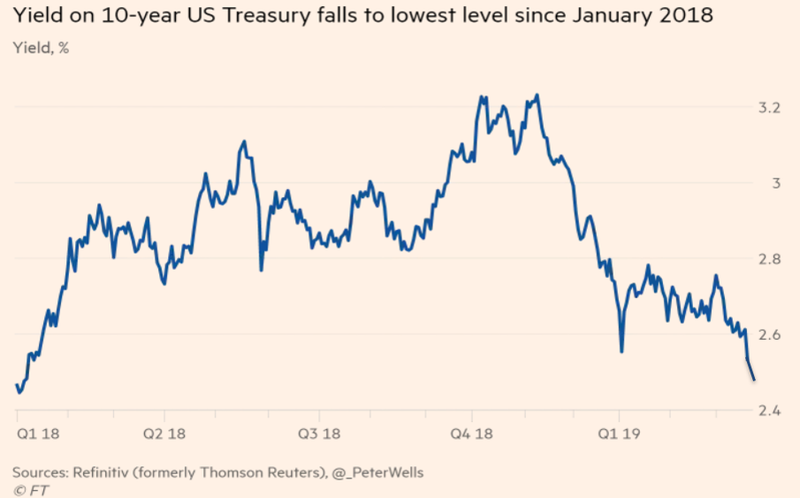 Interestingly, the move on Wednesday was the largest rally for Treasury bonds since last May, and we are not far way from the lows of early last year. Intermediate-term government bonds gained +1.2% for the week and while high-yield was flat. Bank loans, however, were down -1.5%. One more thing on fixed income – the yield on the German 10-year is negative again. 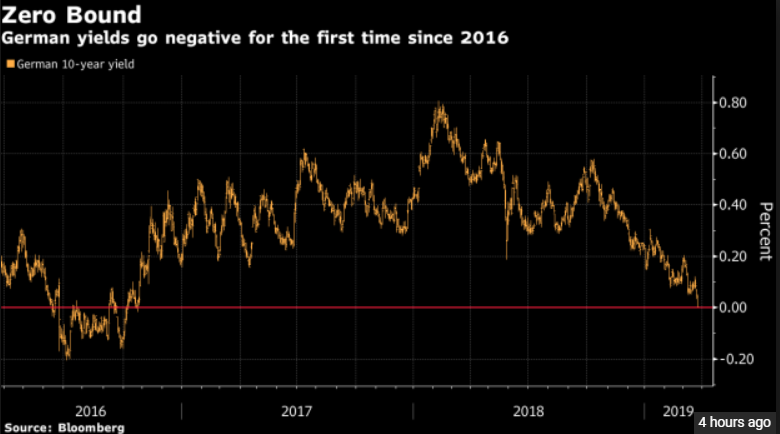 This is the first visit to negative territory since 2016. 1) No rate change as expected. 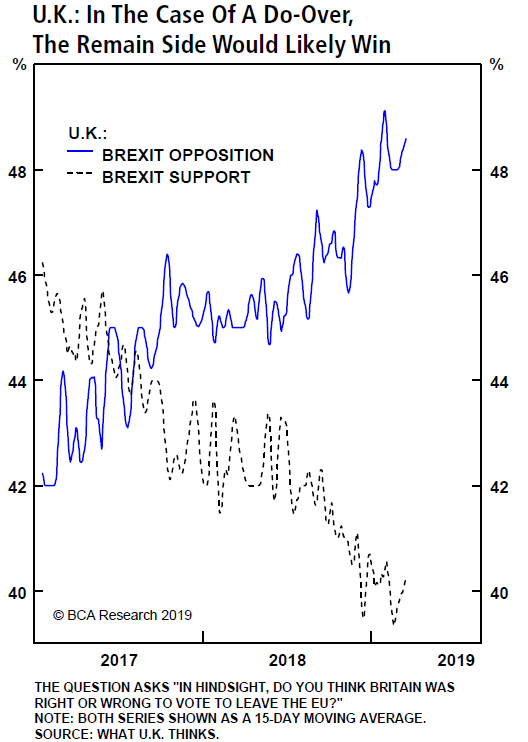 2) They don’t anticipate raising rates in 2019 at all – this was probably more accommodative than originally thought. 3) Only one rate hike is expected for 2020. 4) They also said that quantitative tightening will end in September and that the pace of tightening will slow before then. For example, the rate of tightening in the Treasury market will slow from $30bn a month to $15bn a month in May. a. Growth in 2019 moved down by two tenths to 2.1%. d. Inflation in 2020 stayed stable at 2.0%. The chart below shows the new Fed dot plot. The yellow dot’s are the estimates from each member of the Fed’s board. The green line is the median estimate. The white and purple lines show what the market is pricing in. As you can see, the market is actually pricing in rate cuts in 2020 and 2021. Even this year the odds of a rate cut have gone up. As you can see below, the odds of one cut are now running at about 40% (this chart is as of Thursday). The odds are almost certainly higher after Friday’s trading session. 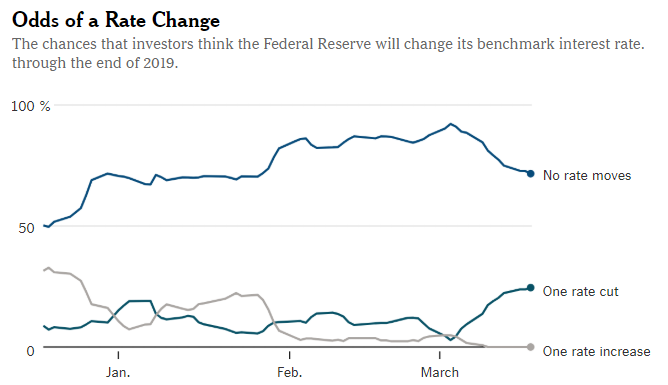 It almost goes without saying that what the Fed does with rates will undoubtedly be governed by what happens with growth and inflation over the next few months. If you could capture consensus opinion, especially after Friday’s trading, it would probably be downbeat. Germany’s manufacturing report stunk, shrinking at fastest pace in more than six and a half years. As we noted earlier, this pushed German 10-year yields back below zero for the first time since 2016. Yields also dipped meaningfully in the U.S. 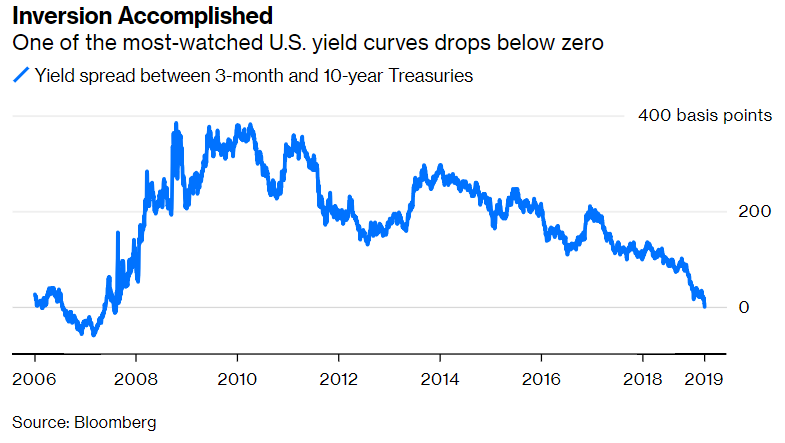 The 10-year yield fell well below 2.50% on Friday and the spread between the 10-year and 3-month went negative for the first time since 2007, as you can see below. 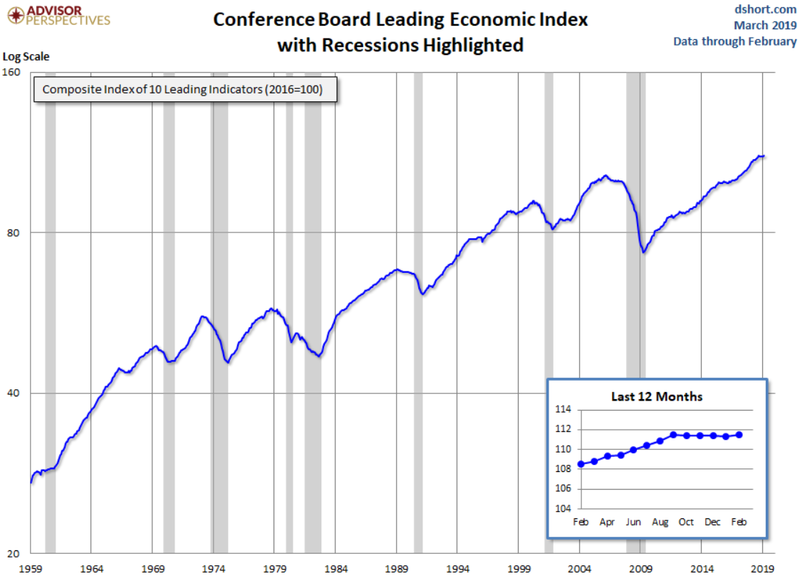 This is typically taken as an early warning sign of recession, and there is some truth to this. How worried we should be is an open question. We talked about this in June last year . But could you make a case that growth might actually pick up in the second half of the year? There is a case to be made. 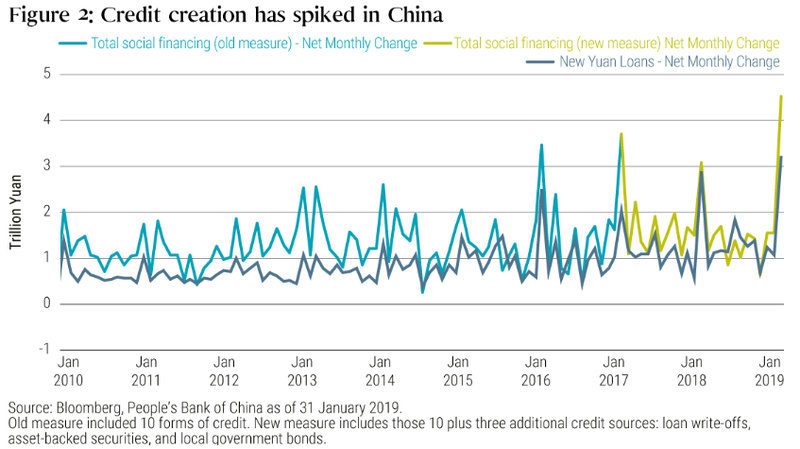 For example, new credit creation surged to a record high of 4.6 trillion yuan (CNY) in January (chart below), exceeding levels reached in 2015–2016. Recent data out of China suggest that these measures may be bearing fruit: Chinese New Year retail sales came in at +8.5% year-over-year (yoy), January exports jumped 9.1% yoy and Chinese aggregate credit creation grew 11% yoy. Maybe this is a flash in the pan, but possibly not. 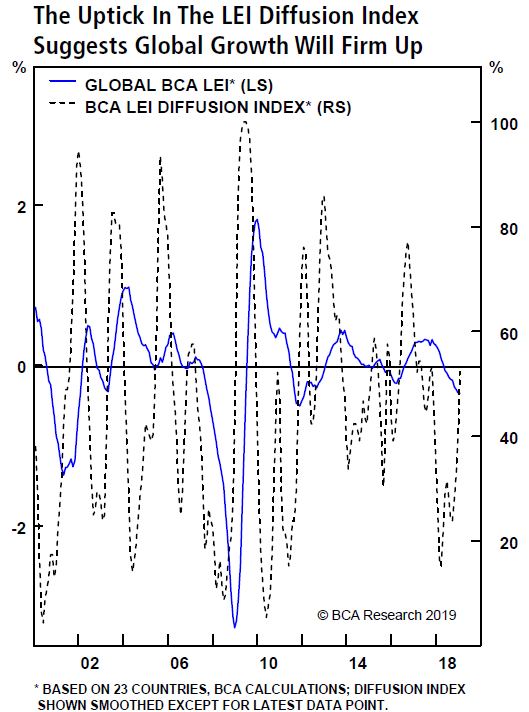 Along the same lines, this week’s release of the LEI in the U.S. showed a modest tick higher. 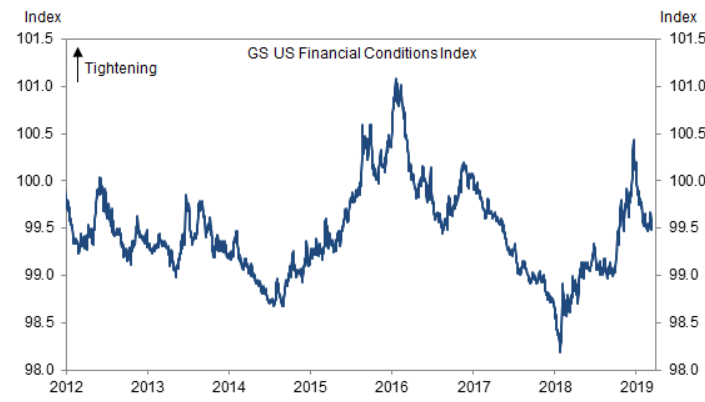 The easing in financial conditions is quickly showing up in the housing data. 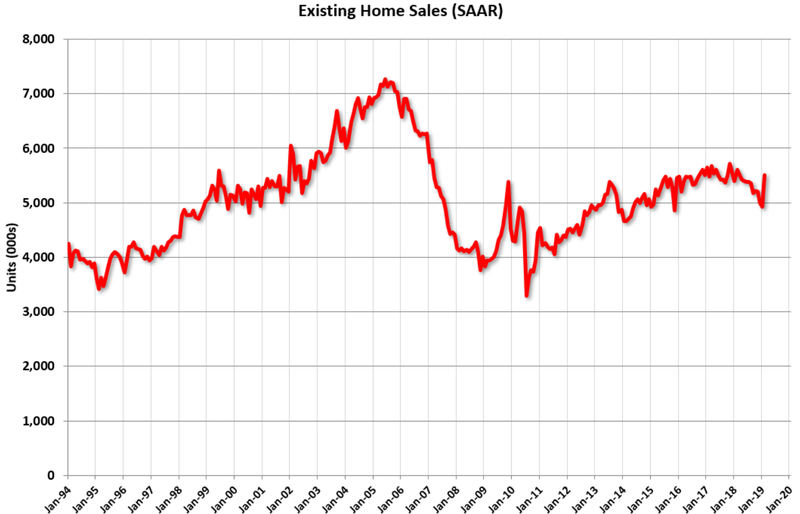 Friday’s report on existing home sales showed a strong rebound in February. Lower rates are clearly boosting activity. If you want the bullish take on housing for the rest of the year this is it. These data points could certainly roll over in March, but it is certainly something worth watch. I suppose we have to talk about Brexit again (just make it go away!!)? This never-ending saga seems like it is approaching the farcical stage. 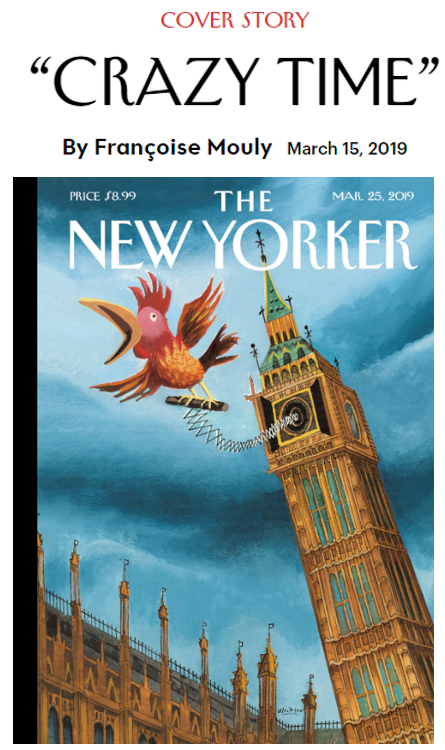 The New Yorker captured it perfectly this week. 3) Rejecting the only deal with Brussels that is on offer. Stalemate. The EU granted the UK a short extension to the March deadline, but it’s beyond me how they can come to an agreement in a week or so. Maybe a national election is the way out if Parliament votes and rejects a deal for a third time? May that lead to another referendum? As you can see below, the result of a second referendum could be very different from the first. 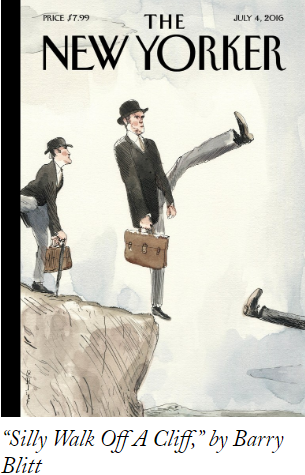 But in the meantime, to steal from another New Yorker cover, the silly walk off the cliff continues for now.